Sudan’s Defence minister Awad Ibn Auf has announced the removal and arrest of President Omar al-Bashir, ending 29 years of authoritarian rule. Bashir was removed by the military on Thursday. A decision to triple the price of bread in the city of Atbara in December sparked months of protests, culminating in this week’s demonstrations when security forces refused to carry out orders to crush dissent. Bashir’s removal comes a week after long-time Algerian President Abdelaziz Bouteflika was forced to resign following similar protests. Bashir is a former commander of the Sudanese army who led a bloodless coup to seize power on June 30, 1989. As chairman of the Revolutionary Command Council for National Salvation, he began to implement Sharia law across Sudan and organized purges and executions of political rivals. In 1993, Bashir appointed himself President of Sudan as leader of his National Congress Party. He was re-elected in 1996, although rival candidates were only given 12 days to campaign in a country a quarter of the size of the US. Sudan has held Presidential elections seven times since Bashir rose to power. However, while opposition groups are allowed, Sudan is widely considered to be a one-party dominant state with rivals having no real chance of winning a vote. The Sudanese Professionals Association has organized rallies since December, amid the bread protests. but resentment against the Bashir regime has been growing for years over economic mismanagement and failing public services. Protesters have been chanting slogans from the 2011 Arab Spring uprising. The demonstrations are also hailed as a stand against sexism with some estimates that 70% of protesters are women. A video of Alaa Salah leading chants during the protests has been shared hundreds of thousands of times on social media. In February, Bashir announced a state of emergency and dissolved the state and regional governments, declaring the protests an attempt to destabilize the country. More than 1000 people are thought to have been detained in recent weeks, with human rights groups suggesting more than 40 have died. In the early hours of Thursday morning, a military coup led by Defence Minister Awad Ibn Auf announced on state TV and radio that Bashir had been removed from office and placed under arrest, without revealing where the former President is being held. A three-month state of emergency was put in place. The Defence Minister also announced a two-year transitional period during which the army will remain in control of the country. The SPA has rejected the military’s statement and is advocating a civilians’ council to oversee the transition period. 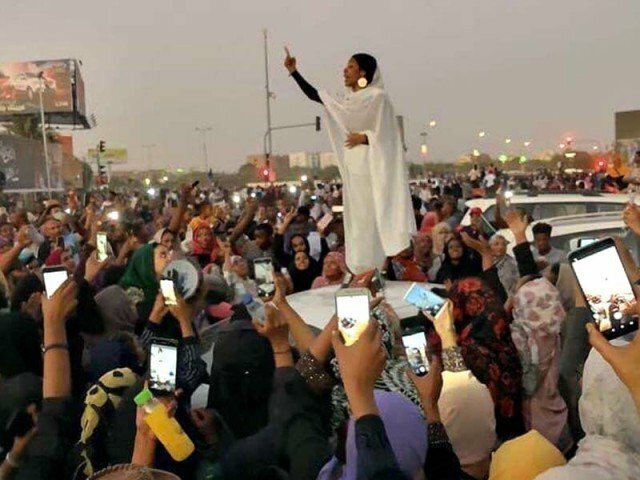 Overnight, the protesters defied a 10 pm curfew “declared for the safety of the citizens” and remained at the sit-in outside the country’s military headquarters in the capital Khartoum. Sudan is also due to reopen its airspace, although its borders remain closed. Russian officials, who have twice hosted Bashir despite his travel ban, say that they are monitoring the situation. The African Union condemned the military coup, saying it was not an appropriate response. Fears are rising that, with no clear route to a handover of control to civilians, the military will retain their power and follow the path that Bashir used for his authoritarian file. With numerous factions fighting across different areas of Sudan, it may prove difficult to establish a stable democracy and society.